The American Nephrology Nurses Association (ANNA) is the professional organization for nephrology nurses. ANNA offers companies, hospitals, and other organizations a variety of marketing options that provide unique opportunities to present information about your products and services to nephrology nurses and health care professionals. 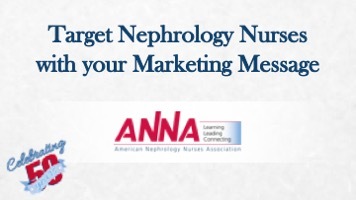 ANNA invites you to take advantage of these marketing opportunities by becoming a Corporate Member, advertising in the Nephrology Nursing Journal and ANNA’s national meeting program books, exhibiting at ANNA national meetings, and partnering with ANNA to develop special projects. Click here to learn more about you can target ANNA members with your marketing message.